The first thing I wanted to do was make some changes in my bedroom. I thought I would show you what I did to my bedside area first. Of course my sister looked at it and said, "I thought you were making fall changes to your room" Duh, I didn't mean I was stringing pumpkin cutouts across the ceiling. Seriously!! What I did do was put away the summery quilt and replace the pink flower dishes. 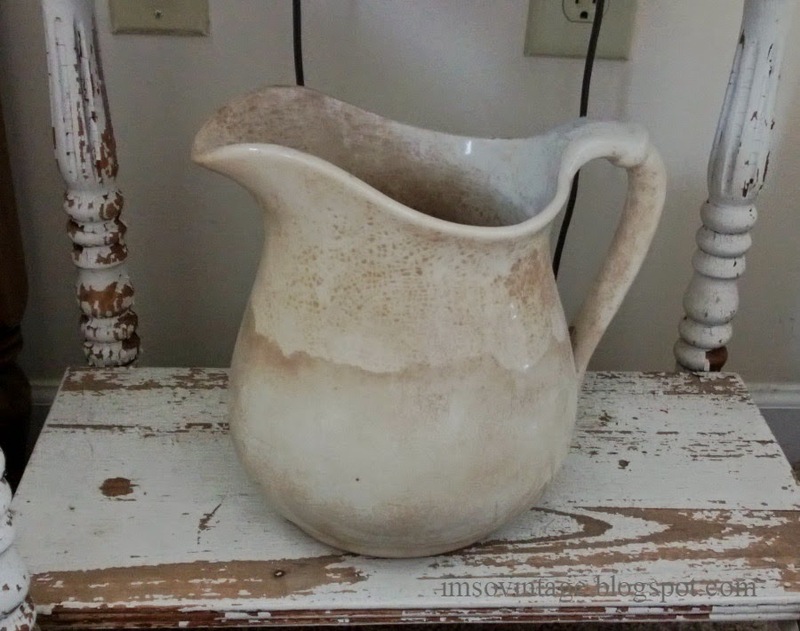 I moved my wonderful old ironstone pitcher from the top of my bedside table to the bottom shelf. It is rather large and was taking up a lot of space. 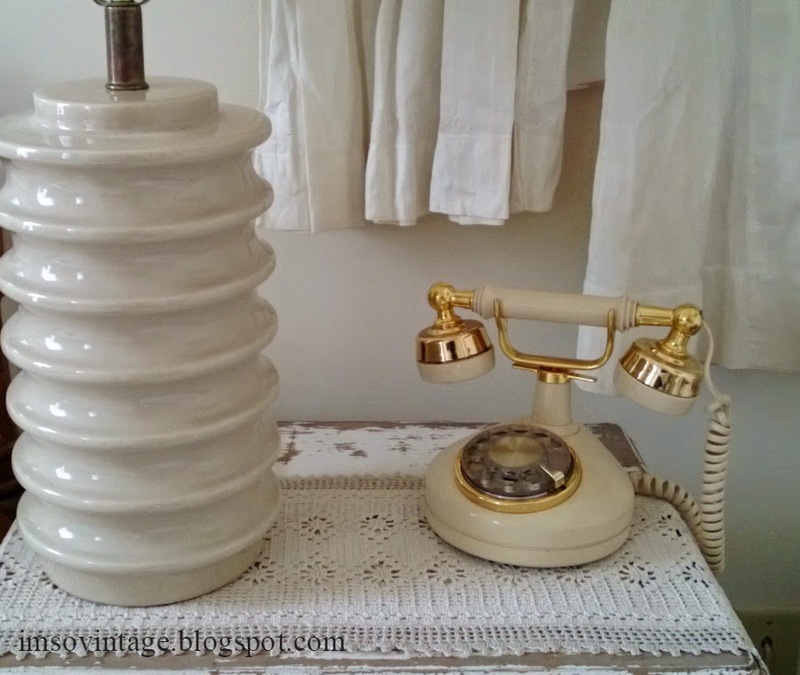 I replaced it with this adorable French style phone from the 1970s that I found a couple of weeks ago at an auction. I think it is perfect with the mid century lamp. I really wanted to change up what was displayed on the top of the hanging shelf. I had just kind of thrown up some roses plates and an old print, but I wasn't feeling the love for it. I think I just wanted it to be simpler. 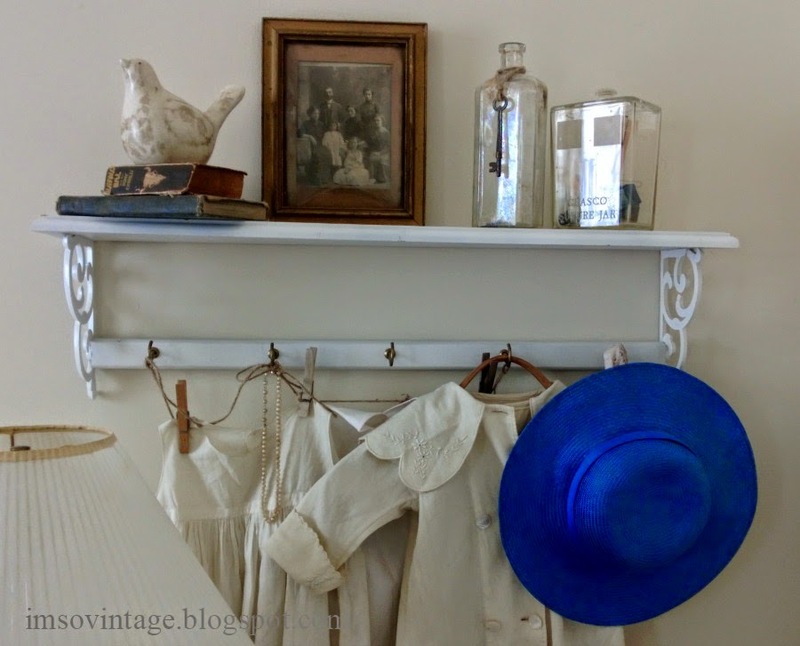 So I started with an old framed photo and added some antique bottles, books, and a sweet bird. 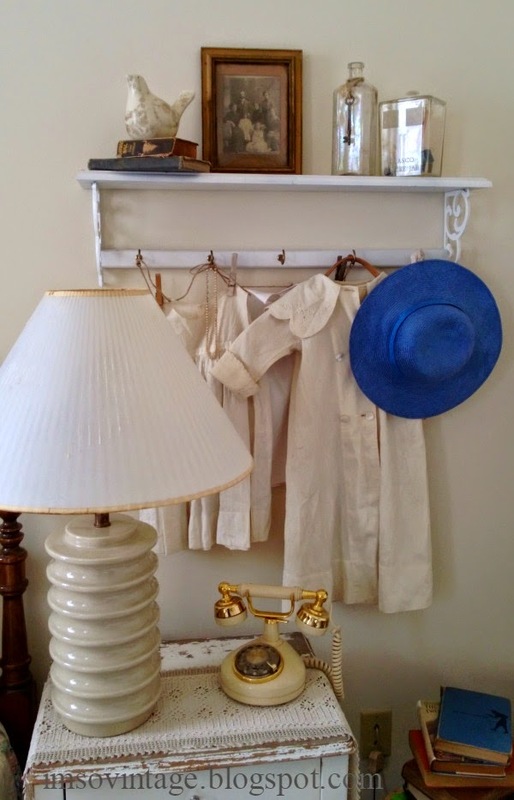 Of course I still have my mom's baby clothes displayed and just because I wanted a touch of color, whimsy, and to still keep a bit of summer I added a blue straw hat. I think I am starting to feel the simple and serene love for fall. Oh Laura, everything looks so darling. 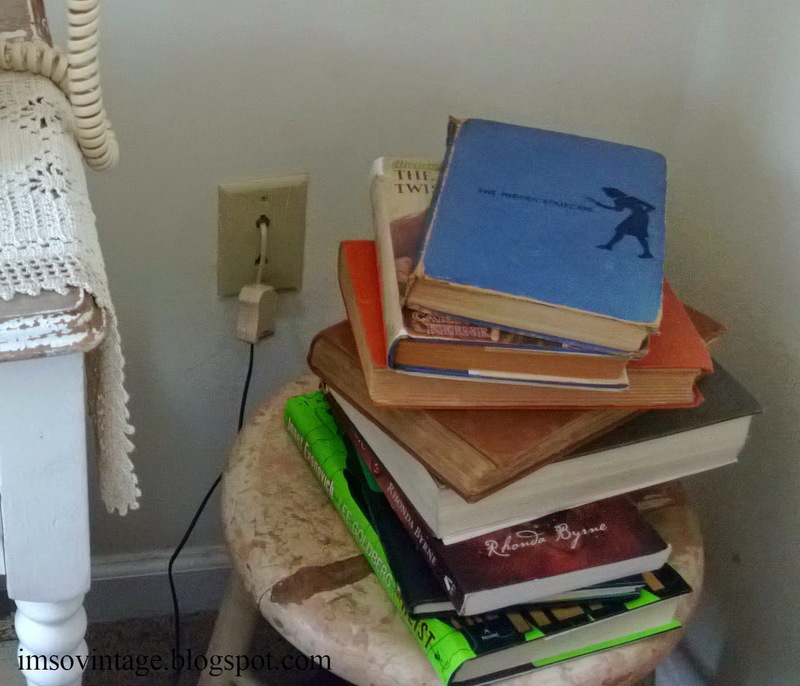 I noticed that Nancy Drew book on the milking stool! Also I used to have that same phone. It was my favorite phone ever! Have a wonderful week, sweet Laura! It's nice to have the shelf with the pegs to hang things up. That's a great place to change things for the seasons. I love the books stacked on the stool, too. It feels good to rearrange things. I've been doing that a lot since we got back. 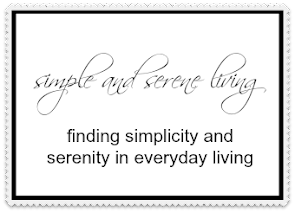 I always feel the need to clean and declutter after a trip! lol I love what you've done in your bedroom. Hugs! Looks great to me! I really like your pitcher. I am slowly collecting ironstone. So cool that you have your Mom's baby clothes! Love that! I love this! I love the way the pink mat behind the photo comes out and is perfect with the stool. That stool is just the right chippy! My heart goes pitter patter over the the baby gowns. Just the cutest! Love it all! Funny how so many of us think orange when Fall comes! calm and cozy place to retreat to. I love the look and simplicity of your Fall bedroom décor. I especially love the old pitcher sitting on the old chippy chair.. Just beautiful! Blessings! Very sweet and inspiring. I especially love the blue hat! You have so many wonderful, original pieces (and books) in your room, it really says so much about you. I wish I had that extra space...we are crowded as it is!. What a pleasure it must be to go in there and relax...in the middle of an afternoon (if you are so lucky), and at bedtime. Very inspiring! Thanks, Tanna. It's a very relaxing place for me to be. Hi, I've just come across your blog and have enjoyed reading through. I LOVE the display you've made if your Mum's baby clothes. They look lively like that. Good idea!